Park Street assists Business Improvement Associations (BIA’s) to select site furniture and amenities that bring outdoor environments to life. Creating shopping experiences that draw people into local businesses is key to a thriving community. Whether you represent a small town or a booming city, Park Street’s diverse products consist of classic designs that boast of your town’s heritage or modern options that showcase innovation and urban development. Will your public space look good for the long term? The most economical products don’t make sense if they rust and deteriorate within a few years of installation. Park Street Solutions represents an exclusive line-up of manufacturers that offer superior quality site furniture and amenities that are built to withstand the test of time. We understand the importance of making a good impression so that visitors to your community have a positive experience, not just today but for years to come. Business Improvement in Canadian Communities. Tanger is committed to bringing the ultimate shopping experience with the best value, the best brands and the best trend-setting ideas. When you’re tired of shopping at the Tanger Outlet Mall in Ottawa, take a break and relax by the fire in outdoor lounge seating from Loll Designs. Browse the complete collection of all-weather recycled HDPE furniture from Loll for products that will create a modern commercial setting that attracts and retains shoppers. Seasonal planting as seen on the Bloor-Yorkville BIA streetscape in Toronto, Ontario is a fantastic way to beautify any commercial environment. The clean lines of this rectangular planter from Old Town Fiberglass perfectly showcase and complement floral, foliage and branches in every season. 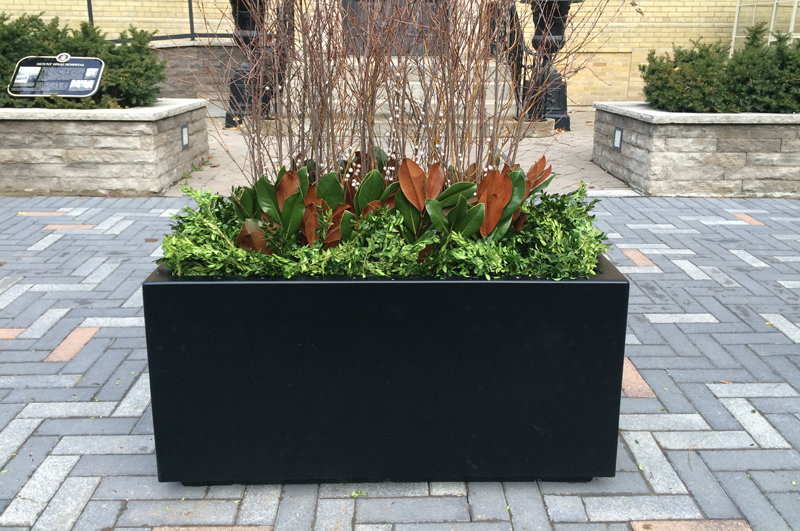 Available in an array of styles, sizes, colours and finishes, Old Town Fiberglass planters are a durable all-season solution that is not susceptible to damage from salt and corrosion. A feature of this Toronto Shopping Centre is the classic steel ribbon site furniture from Victor Stanley. Victor Stanley utilizes custom-designed powder coating systems, computerized welding robots and automated metal-working equipment to manufacture site furniture that will endure rugged Canadian winters for years to come. This commercial grade street furniture is comprised of extremely thick solid steel that offers superior strength and outweighs similar styles of site furniture available in the marketplace. State-of-the-art powder coating is applied twice as thick as the industry standard for added durability and weather resistance. The Exchange District in downtown Winnipeg is a national historic site comprised of twenty city blocks and approximately 150 heritage buildings. 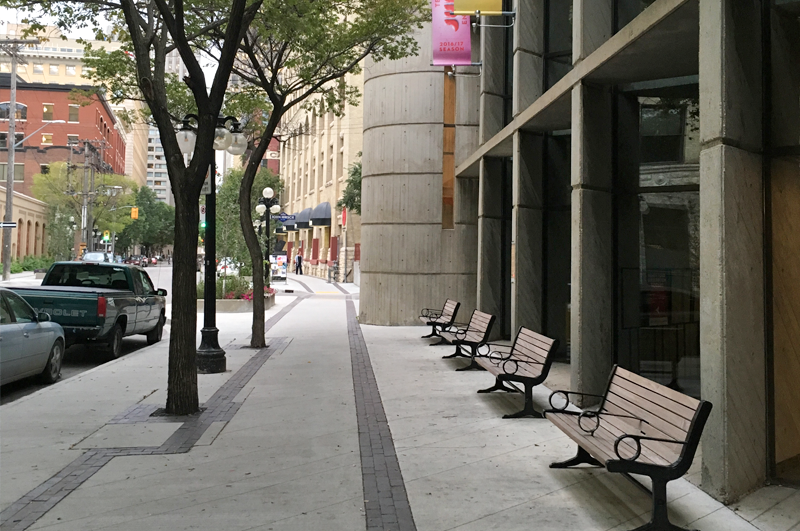 The C-140 Bench from Victor Stanley is iconic to this streetscape and is seen lining streets throughout the downtown area. 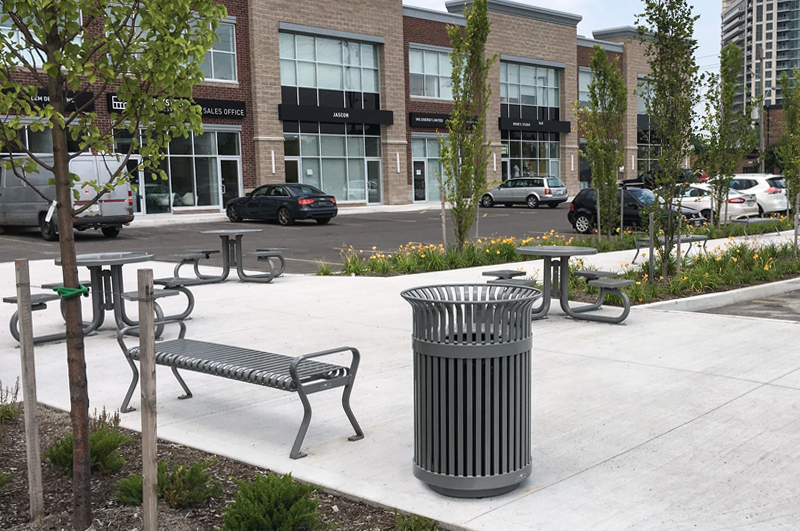 For Business Improvement Associations developing historical regions, Victor Stanley offers a wide range of classically styled street furniture available in complementary designs for benches, litter receptacles, bike racks and more. Contact Park Street for assistance with selecting street furniture and outdoor amenities that will enhance your business improvement district.